The original King Kong film was made in 1933 and starred Fay Wray. The idea for the story was created by Merian C Cooper and Edgar Wallace. It opened to rave reviews and has been ranked as the greatest horror film of all time, and the twentieth greatest film of all time. Some of the special effects crew on the film came from working on the history-making film The Lost World. The film was so popular it was re-released five times, sold to television, and issued on laser disc, VHS and DVD. 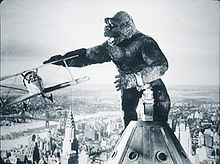 In 2005 Warner Bros. released their digital restoration of King Kong in a US 2-disc Special Edition DVD, coinciding with the theatrical release of Peter Jackson's remake. According to Wikipedia, Legendary Pictures and Warner Bros. plan to release a Kong prequel/reboot film titled Kong: Skull Island, set to be released in 2017 and directed by Jordan Vogt-Roberts. Carl Denham is a producer and director of adventure films specializing in remote and exotic locations. He sets off to a remote island, uncharted except for a map he purchased from a seaman. He hires a ship with a large crew, and with the star of his film, Ann Darrell, and his friend explorer John Driscoll, he sets off to Skull Island. No one knows what they will encounter on this island and why it is so mysterious, but once they reach it, they will soon find out. The island is home to prehistoric life and Kong, a 25-foot tall gorilla that can outfight any monster on earth. The island itself is is divided and the giant ape lives behind a great wall. When the local islanders kidnap Ann to offer her as a sacrifice, Denham, John Driscoll, and part of the crew set off to rescue her. Driscoll is in love with Ann and Denham aims to capture the animal for an exhibition in New York. They hike into the jungle, where dinosaurs live, trying to rescue Ann. 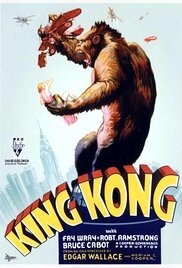 King Kong falls in love with Ann and protects her against the dangers. It's obvious that Kong is fascinated with Ann and means her no harm but Denham gasses the beast and transports it to New York where he puts it on display. When it manages to escape, it terrorizes the city. Kong sees Ann in an upper floor hotel room, he reaches in the window, grabs her, and carries her to the top of the Empire State Building. The ape gently sets Ann down on the building's observation deck and climbs atop the upper mast, trying to fend off the attackers. He manages to swat one plane down, but he is mortally wounded by machine-gun fire and plummets to his death in the street below.